When I first launched this personal website, I began by filing a weekly feature Diary of a Theatre Addict that chronicled my weekly theatrical travels (and sometimes travails). This regularly involved seeing at least six shows, and sometimes up to 12, a week. I partly excused myself that this was, after all, my job — something that I earn a living from. But I also have long known that there’s no reason on earth for me to have to go to the theatre this much to fulfil my professional obligations. Most of my professional colleagues will see between two and five shows a week, tops. This allows them to live lives that are not entirely filled with theatre. And to have nights off. Me, I feel at a loose end if I’m not at the theatre. So it was more than just a job, but a whole way of life for me: a yearning to fill an empty hole in my life, combined with a fear of missing out on one show or another. 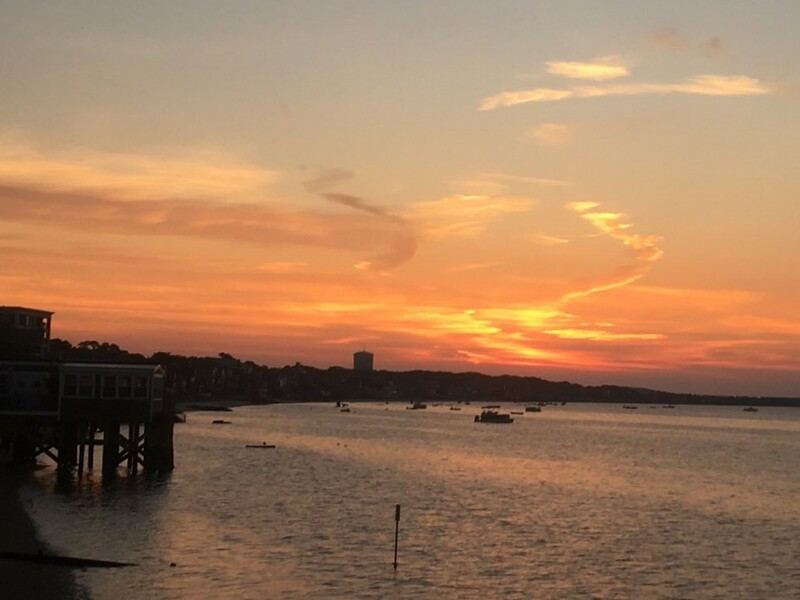 And even though I’ve also realised that its simply impossible to see EVERYTHING, I still chase my tail — not just in London but also up and down the country, and across the Atlantic to New York, to try to see as much as I possibly can. The only way to (try to) stop is to leave the country. My husband and I now make sure we take at least two separate weeks a year to go to a place like Barbados or Gran Canaria where there simply is no theatre, so I couldn’t go even if I wanted to. 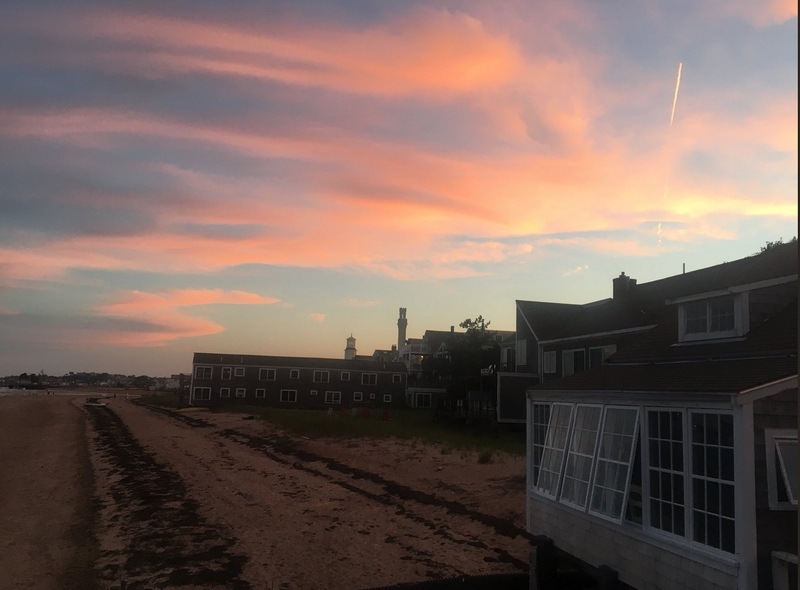 But this summer we’ve taken, for the first time, an even bigger break: we’re relocated to Provincetown (sunset pictured right) on Cape Cod for a nine-week stay (up to the middle of September). I binged on theatre by prefacing it with a stay’s stay in New York first at the beginning of July. Provincetown, of course, is not an entirely theatre-free zone — there’s plenty live entertainment, from a lot of drag cabarets to male strip shows and piano bars, to enjoy. Plus Boston is just a 90 minute ferry ride away, and New York another 3 hours on a train from Boston. So my addict has still been served while I’ve been here with two weekend return trips to New York, and three visits to Boston (once passing though en route back from New York, and two more day return trips) to see Moulin Rouge premiering there (I said I was addicted!). 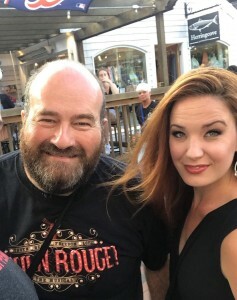 Some of these theatre trips actually HAVE been work: I’ve reviewed Moulin Rouge, Head over Heels, This Ain’t No Disco, Gettin’ the Band Back Together and Pretty Woman for The Stage. 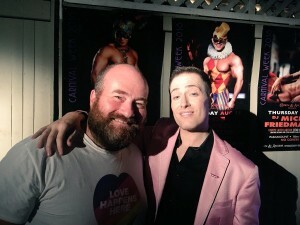 (But my two return trips to Moulin Rouge were for sheer pleasure!). And I’ve also been dipping into P-town theatrical offerings, too, from time to time, and found a lot of variety — from the weekly drag variety night Showgirls (held the night I went in the auditorium of the local high school — there’s diversity in action for you!) 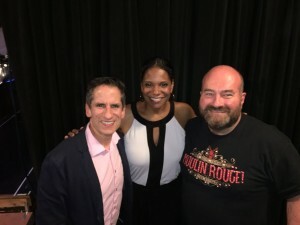 to the extraordinarily intimate and revealing cabaret season, produced by Mark Cortale and led by Seth Rudetsky as interviewer and pianist, now in its 8th year at the Arthouse. In an auditorium that seats little more a hundred spectators, they bring top-line Broadway talent to town in intimate song and revealing conversation. In the last few weeks, I’ve been enchanted by such thrillingly original and diverse Broadway voices as Liz Callaway, Judy Kuhn, Christine Ebersole and Sierra Boggess (pictured right with me)– four singers at the very top of their game — as well as charming evenings with male singers Adam Pascal (the original Roger in Rent) and Will Swenson. Still to come this season are Stephanie J Block, Marilyn Maye and Alice Ripley. Rudetsky and his producer Cortale also brought Jeremy Jordan to the larger stage and auditorium of Town Hall, but creating the same degree of intimacy and rapport with one of Broadway’s most delightful leading men, ahead of a return to Broadway in a new play in October (and a two-night London run at Cadogan Hall, without Rudetsky, in early September). 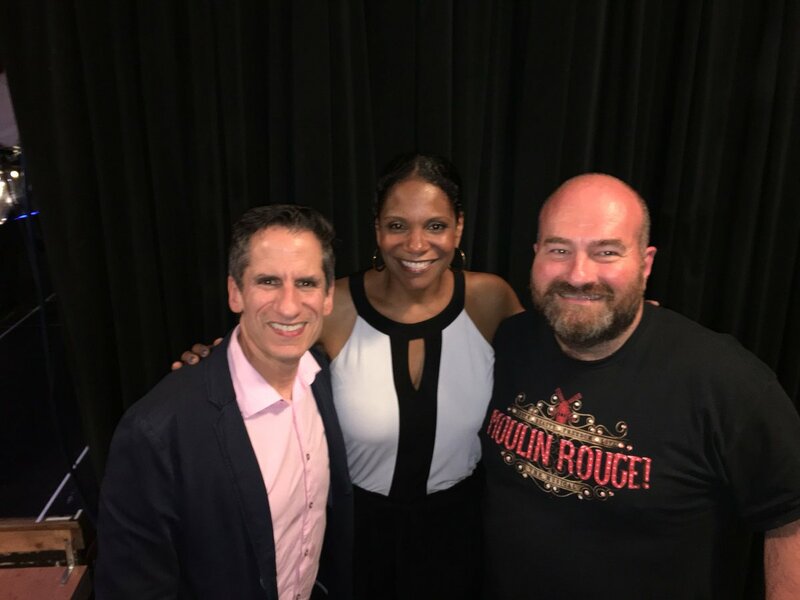 And best of all, I travelled further down the Cape to Cotuit last weekend, for a stunning afternoon at Cotuit Center for the Arts with Broadway’s most lauded of all performers — the six-times Tony winner Audra McDonald (pictured below with Seth Rudetsky). I’ve long followed McDonald — in fact virtually stalked her — at venues large and small, seeing every single one of her Broadway starring roles since the transfer of the National’s Carousel to Lincoln Center in 1994 (in which she won her first Tony for playing Carrie Pipperidge) to Shuffle Along in 2016, with plays like Master Class, A Rainin the Sun and Lady Day at Emerson’s Bar and Grill in between as well as musicals like Ragtime, Marie Christine, 110 in the Shade and Porgy and Bess. She is, without doubt, the greatest Broadway singing talent to have been born and come to prominence in my lifetime (I’m seven years older than she is!) and I’ve long championed her talents in the classes I teach at ArtsEd London to first year musical theatre students, as the best contemporary soprano in musical theatre since the late, great Barbara Cook. Another local promoter Rick Murray also brings Broadway talent to the Crown and Anchor, a combined hotel, restaurant and bar resort he runs in the centre of town, and here I’ve so far seen Lucie Arnaz in a delightful cabaret retrospective of her life and career. I’ve also bought tickets here to see drag fixture Dina Martina, in the 13th consecutive season here, as well as a live appearance by the the wonderful online musical satirist Randy Rainbown (pictured right), whose adaptations of popular musical theatre songs have provided simultaneously the best affront and respite I know to the appalling comedy of the Trump regime. I’m also looking forward to appearances there by Anthony Rapp (Rent’s original Mark Cohen) and Linda Eder. 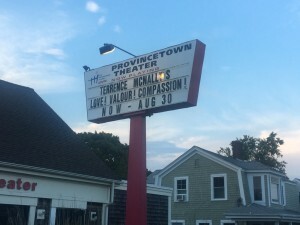 As on Broadway, plays are in short supply in P-town — but valiantly flying the flag for them is the venerable Provincetown Theater, now newly under the artistic directorship of David Drake, who this summer have presented a spellbinding revival of Terrence McNally’s 1995 Tony winning play Love! Valour! Compassion!, whose first night McNally himself attended. 23 years since its original Broadway run, this Chekhovian-flavoured drama of gay friendships and relationships unfolding in a house beside a lake is still piercingly relevant and moving — a modern classic. And David Drake leads a terrific local cast in his own fine production. P-town is lucky to have him here!